In Sri Lanka, cashew nuts are sold fresh, still tender and creamy-soft. They make a fabulous curry. Over here, you will need to soak, then simmer the cashew nuts to get them back to something close to their original state. It’s definitely worth the bother. First, make the roasted curry powder. Drain the soaked cashew nuts, then simmer with the turmeric in lightly salted water for about 30 minutes, or until soft and creamy. Drain, discarding the cooking liquid. Meanwhile, trim the top off the lemon grass stem, leaving just the lower 7–8cm, then crush this with the back of a wooden spoon. Heat the oil in a saucepan or wok, add the onion and fry for about 5 minutes. Stir in the garlic, cinnamon stick and bay leaves; fry for another 3–4 minutes until the onion is tender. Sprinkle over the cayenne pepper, paprika and roasted curry powder and fry for a final 30 seconds or so before adding the coconut milk, lemon grass and a pinch of salt. 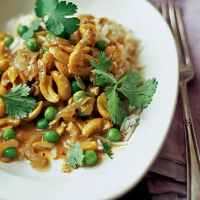 Bring to the boil and add the cashews; simmer for 5 minutes, then add the peas and simmer for a final 2–3 minutes. Taste and adjust the seasoning. Finally, sprinkle with fresh coriander to serve.